Jon Warden was born on Tuesday, October 1, 1946, in Columbus, Ohio. Warden was 21 years old when he broke into the big leagues on April 11, 1968, with the Detroit Tigers. His biographical data, year-by-year hitting stats, fielding stats, pitching stats (where applicable), career totals, uniform numbers, salary data and miscellaneous items-of-interest are presented by Baseball Almanac on this comprehensive Jon Warden baseball stats page. Jonathan Edgar Warden was a Major League Baseball player who pitched for the Detroit Tigers in 1968 . Warbler, his nickname, "only" appeared in twenty-eight regular season games, but ended the year with a 4-1 record, a 3.68 ERA, three saves, and he was included on the 25-man roster during the 1968 World Series . Jon never took the mound during the 1968 Fall Classic , but his Tigers defeated the St. Louis Cardinals 4-3. Warden received a full World Series Gate Share , equal to $10,936 that year, which was $936 more than he had made during the regular season! 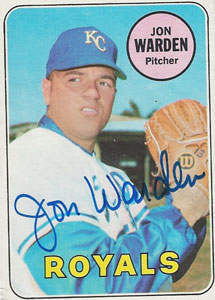 Did you know that Jon Warden made a little baseball history in 1968 ? On April 11, 1968 , he made his debut, pitching in relief for Denny McLain , and Warden earned the win. His next appearance, April 17, 1968 , he relieved Fred Lasher in the 10th inning, Detroit ended the tie that frame, earning Jon another win. On April 20, 1968 , he relieved Lasher again, earned the win again, and became the first American League relief pitcher to win his first three consecutive appearances after making the majors !